Located in downtown Cabo San Lucas, the hotel with its 88 air-conditioned rooms, large swimming pool, restaurant and bar AND free WI-FI, offers classic Mexican charm near beaches, golf, the marina, shopping and restaurants. 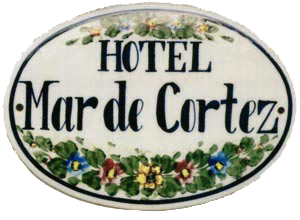 The Hotel Mar de Cortez was among the first three hotels in Cabo San Lucas when it was a quaint fishing village. The architecture of the rooms and suites reflect the charming Mexican flavor of southern Baja. Each year the hotel upgrades various aspects of the facilities. We have four basic room-types, each very popular and reflecting the old and the new of Baja. Many of the accommodations open up to the pool area, others to the courtyard. Family owned and operated for the past 35+ years, the hotel has also retained many of its friendly staff members who recognize returning guests with an especially warm smile. In fact, our repeat clientele is significant, surely attributed to our great service, excellent rates and down home hospitality. What else do guests love about us? Lush gardens, beautiful pool and down-home hospitality for starters. There is private parking behind the hotel, a satellite TV in the bar, filtered drinking water in each room, and a public phone in the lobby. There are complimentary safe deposit boxes at the front desk and security precautions throughout the hotel 24/7. Free Wi-Fi. Car rentals and a multitude of activity reservations can be made from the front desk staff. We have a large upgraded & remodeled walk-in freezer for the fishermen to store their fish. The rates at the Hotel Mar de Cortez are the best value offered in all of Cabo San Lucas. Others may SAY they have the best value, but when you consider that for the same rates we also have the large swimming pool, indoor-outdoor restaurant, and spacious bar and free wi-fi, there is nothing like it in Cabo San Lucas! Our new manager, Simon Yee, Jr, eldest son in the Yee family who have managed the hotel for 30+ years, is looking forward to meeting you when you arrive, and Eduardo Vasquez, our front desk manager, and his staff, will always have a smile on their face and a willingness to help when you arrive. Hospitality is key, great service essential. They look forward to your visit. And Ana Chong is our Concierge for activities, etc. and will help you go where you want to go and see what you want to see... etc. Car rentals, side trips, water activities, etc., are her specialty. Come to the Hotel Mar de Cortez and capture the friendly flavor of Baja where the sun meets the Sea of Cortez. You can call our International Reservations Office in CA, 1-831-663-5803 , or 1-800-347-8821 (toll free if calling from US, Canada or Mexico). Nat will help you get the best price and room location for your time at 'the Mar'. To speak in Spanish, call the hotel directly: 624-143-0032. For questions and special requests you can also email mardecortez4info@gmail.com. If you do not see the room-type you would prefer, contact the Int'l Reservations Office. EL CORTEZ RESTAURANT & BAR: . Breakfast, lunch and dinner, and snacks are being served in the restaurant or poolside, and the TV in the bar is there for all the sports events that are forthcoming these days, etc. See our new breakfast promotion... Breakfast included in SOME BUT NOT ALL bookings, when booked direct thru our website or US Reservations Office. See promotions for the details and certain restrictions. Room service is also available.